All right, pop quiz: Name the first 3 three dishes that come into your head when you think “vegetarian cuisine.” Go! (No, seriously. Reader requests welcome.) For me, this list includes stuffed bell peppers; which is a bit ironic considering I’ve never actually made stuffed bell peppers. Until this week, that is. I’ve had stuffed bell peppers before, but never a vegetarian one that I’ve enjoyed. Meat has a nice flavoring effect that can be difficult to compete with at times. Enter the power of spices. 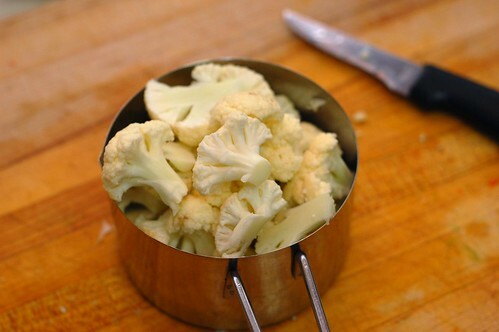 Both couscous and cauliflower have very mild flavors, so it’s up to the spices and sauted aromatics of the dish to take center stage. 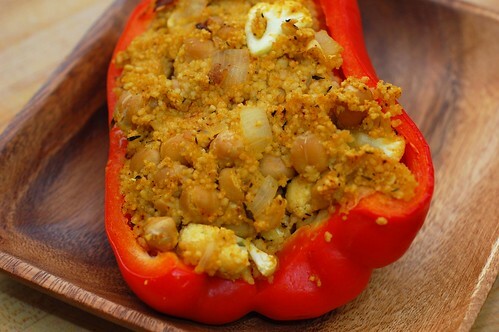 The chickpeas add a subtle flavor but also a nice additional texture. You can use any type of bell pepper you’d like, but I recommend a red or yellow. Their sweeter flavors really complement the curry of the filling; which fortunately isn’t lost in the roasting process. You can use big long red bell peppers like I did, but I’d recommend the more traditional shorter fat ones if you have a choice. Of course, these have the nice advantage of becoming quasi-finger food. Saute the onion and thyme in oil under medium high heat until browned; approximately three minutes. Lower to medium heat and add the garlic for an additional minute; stirring frequently to prevent burning. Transfer to a medium bowl along with the remaining ingredients and mix until well combined. Add additional salt and pepper to taste. 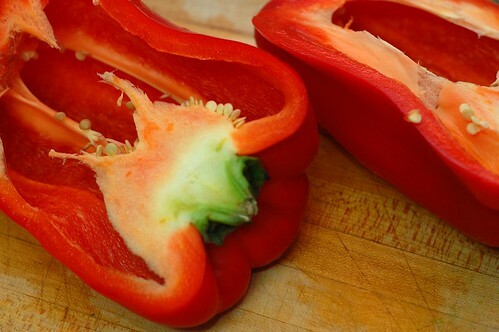 Cut off the top half inch of your bell peppers and remove seeds and membrane. Stuff your bell peppers with your filling, placing them in a glass baking pan as you go (metal sheets would work in a pinch, but you may want to oil it first). If you have extra, just pile it on top. Place your peppers in the oven for 25-30 minutes, until everything is cooked through. Enjoy. do you think you could use quinoa?